Diabetes management can be tough no matter what the time of year, but during the holidays it can feel next to impossible. You know you need to control your blood sugar, but with so many tempting treats around you, how can you resist? Our team in Glendale has put together some helpful tips that can help you make it through the holidays, successfully managing your blood sugar while still getting to enjoy a few treats. Our tips may make it easier to manage than you thought possible! As always, if you have any questions about your diabetes or concerns about your health, you can contact our team to make an appointment. We’ll be available during the holiday season to help you with all aspects of your health, including your diabetes. One of the most important things you can do in order to keep your diabetes under control is to stick to your regular schedule. That’s easier said than done during the hustle and bustle of the holidays, though. One thing you’ll want to do, though, is sticking to your regular meals times as closely as possible. If you are used to eating dinner at 6 pm but the holiday party isn’t starting until 7:30 pm, then go ahead and have a small meal or snack at 6 pm. You’ll simply have a smaller, healthier meal at 7:30 pm at the party. Not only will that help you keep your blood sugar levels stable, but you’ll probably end up making healthier choices at the party buffet, too. It’s hard to avoid all of the delicious treats available during the holidays, all of the loaded with sugar and calories but oh-so-good to eat. The good news is that it’s difficult to find a holiday party that’s totally devoid of veggies, too. Almost every party will supply some kind of vegetable tray alongside all of the other most indulgent items, so head there first. Load your plate with plenty of vegetables and you’ll leave less room for the other items. Not only is this good for your blood sugar, but it will help you avoid holiday weight gain, too. Alcohol can seriously mess with your blood sugar levels. Not only that, it can actually interfere with the effectiveness of your medication. It’s a good idea to avoid much alcohol during the holidays and drink plenty of water instead. Drinking a glass of water before a meal can help you avoid temptation at the dinner table, too, because it will help you feel more full. If you do decide to enjoy a glass of something, stick to a light beer or glass of wine. A glass of wine may actually be beneficial to your health! It’s easy to get caught up in all of the activities of the holidays and end up throwing your sleep schedule off. But getting enough sleep is really key to keeping your health on track. You are less likely to get in an accident or be injured when you’ve had enough rest, and it’s better for your mental health and stress levels, too. Try to get to bed at the same time every night and aim for a minimum of seven hours of sleep. If you aren’t getting it, start excusing yourself from the party a little earlier. Getting enough sleep is more important than another hour at the party. It’s okay to indulge during the holidays, as long as you do it responsibly. Most diabetics are still able to enjoy a slice of their favorite pie or a few of their favorite Christmas cookies. The key is to choose your favorite item and enjoy a little bit of it. Fill the rest of your plate with a healthy balance of foods. If you do end up overindulging, then you’ll want to cut out the carbs at your next meal in order to help balance out your blood sugar level. Have Questions about Diabetes Management? We have answers. Men’s Vitality Center in Glendale is here to help you with all aspects of men’s health, from diabetes management to low testosterone treatments to opiate addiction treatment. 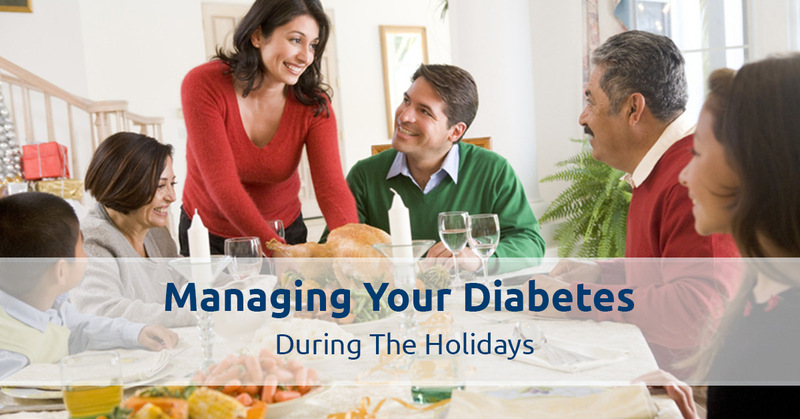 We know how frustrating diabetes can be during the holidays so our team is here to help you. If you have questions about what you can or cannot eat, are concerned about your testing results, or are experiencing new symptoms, then get in touch with our team. You can give us a call and speak with a member of our team, or schedule an appointment online and see us in person. We’ll be here for you throughout the holidays so you can get the care that you need, no matter what time of year it is. Enjoy your holidays and let us know if we can help make them better!